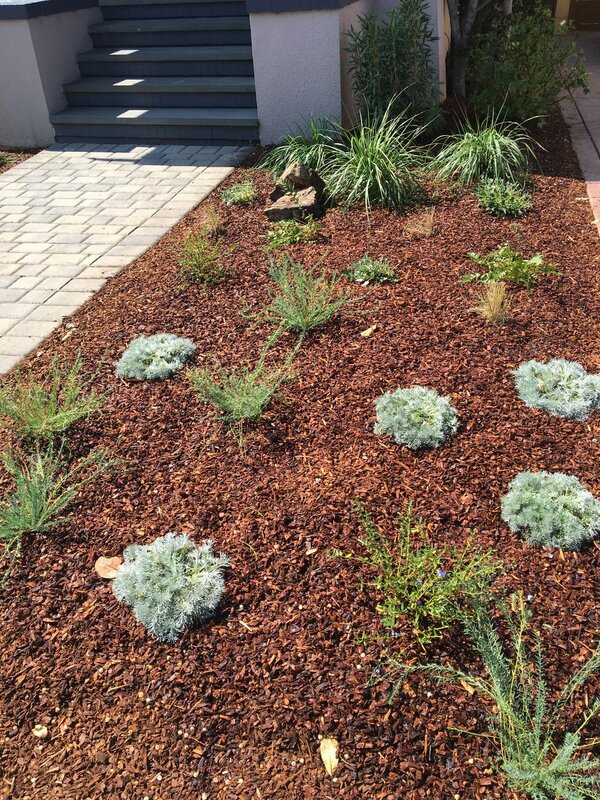 We employ sustainable techniques and minimize ecological impact while creating gorgeous gardens. We employ skilled craftsmen to properly prune, amend soil, edit landscapes and bring new plantings to life. Everything we do is to improve the look and health of your garden. Our creative artists can breathe new life into your outdoor space with fresh designs that account for environmental impact and to choose plants that invite wildlife. Our team brings a varieties of skills to the table, from caring for your pond to updating your outdoor lighting scheme. We can ensure your bee hives make it through the winter and that your vegetable garden provides a year round bounty. We took an empty space in the backyard of a beautifully remodeled home and created a playground for the owner’s children. We reused redwood tree stumps to create a fun place to jump and run. We built a sensory meadow out of soft and herbal plants and a faux sandy creek bed for filling dump trucks, building sandcastles, and endless hours of fun. 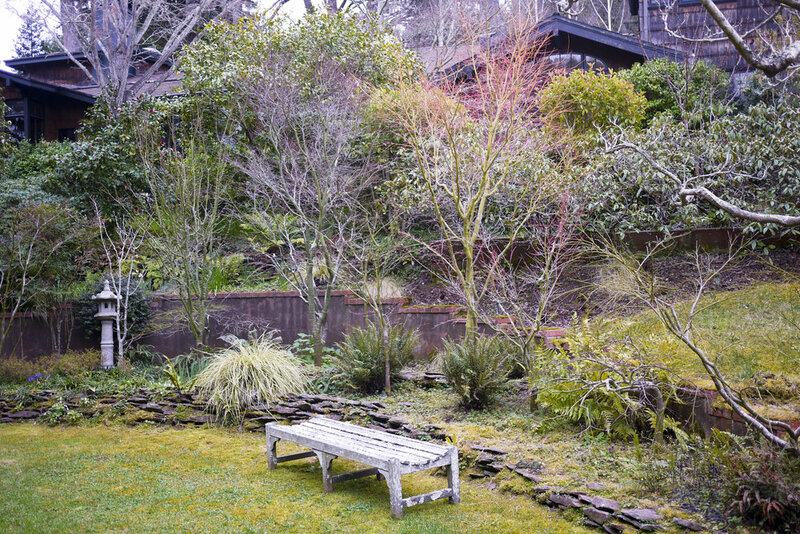 This garden sits atop a windswept hill in San Carlos. The soil is made up of mostly rock and clay. There are herds of resident deer that continually challenge our knowledge of ‘deer proof’ plants. The owners are partial to native plants, but recognize the need to compromise with the deer and like to also include many herbaceous plants with pungent aromas. There are many old growth Live Oak trees on the property. We have managed this estate for over 10 years and it is one of our dearest gardens. It is also our oldest at over 100 years old. We have continually sought to preserve the historic nature of this property while creating innovative new plantings to reduce water use, encourage wildlife and highlight the mature forest that exists here. The owners care deeply for their garden and spend time in it regularly for relaxation and entertaining. This bachelor pad was having a major interior redesign and remodel and we were hired to turn the vacant patio space into a vibrant garden highlighting the priceless San Francisco views. We created a riotous color palette and framed the skyline with lush beauty. The garden is frequently visited by bees and hummingbirds looking for respite in the concrete jungle. We added fruit trees as a source of food for the client and a tropically themed plant wall next to the hot tub. 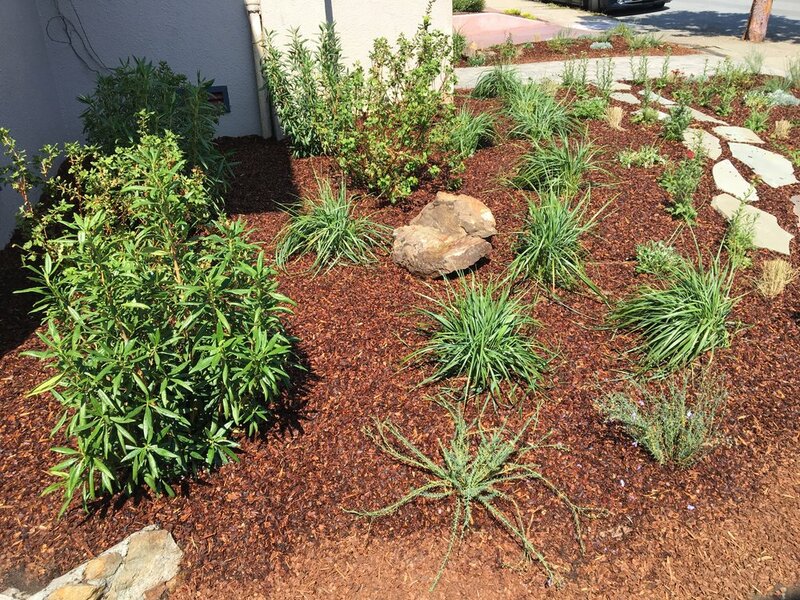 This native garden is a major source of pride for the homeowner. He collaborated on the original design and even installed the slate slab table in the backyard himself. Beaten by wind and salt spray, this garden thrives in sandy soil which retains very little water or nutrients. The native plants we chose, such as: Wild Lilac, California Poppy and Buckwheat, are well adapted to such a harsh environment. We specifically planted Dune Tansy which covered the dunes of this neighborhood before any houses had been built. We took this weedy front yard lawn and converted it into a verdant, layered grassland garden. There are foundation shrubs against the house: large Karl Forester grasses and Bush Anemones. To create more colorful interest closer to the sidewalk, we used a mostly blue and red palette. This includes Cardinal Flower, Sand Hill Sage and Blue Flax to highlight the beautiful colors of the home.